One important thing to note before we proceed is that there ended up being two different versions of Sonic Unleashed. Both tell the same story, but they have a few differences between them in terms of structure and mechanics. The version for Xbox 360 and PlayStation 3 was developed using a combination of a new piece of technology that Sonic Team called the Hedgehog Engine and the Havok physics systems that had been used in Sonic 2006. The version for Wii and PlayStation 2, meanwhile, was developed on a modified version of an engine that Sega already had. There are numerous differences between the versions. 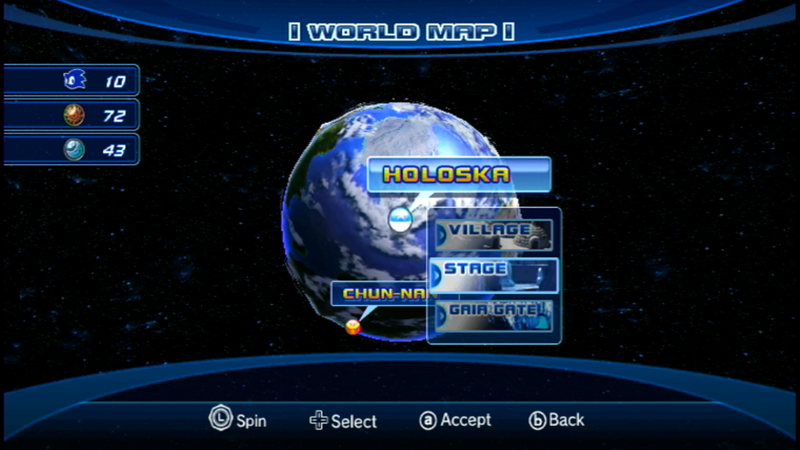 The HD versions have more areas on the world map with action stages, but the stages themselves are structured a little differently. The HD versions are also regarded as a little more challenging, with longer stages, and feature explorable 3D hub worlds for each region Sonic visits. The Wii and PS2 versions, meanwhile, feature a more streamlined structure with shorter, more self-contained stages, but add explorable temples with environmental puzzles as a means of unlocking bonus content and permanent upgrades to Sonic’s abilities. Opinions differ on which of the two versions is the “best” and ultimately it’s probably mostly a matter of taste, so try both if you’re curious! 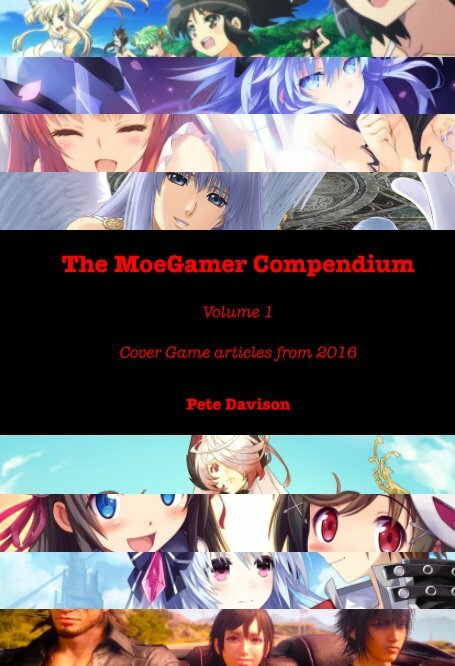 The remainder of this article is based on my experience with the Wii version. 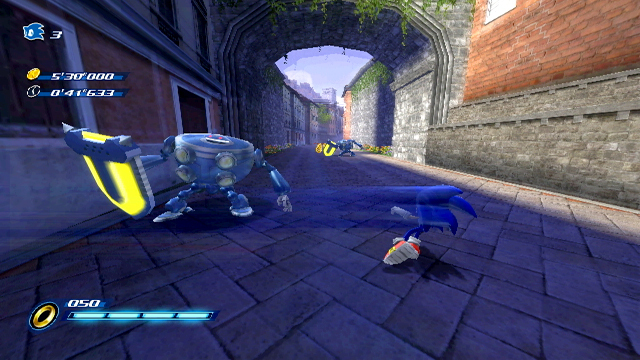 Lead designer Yoshihisa Hashimoto’s stated aim with what would become Sonic Unleashed was to try and avoid having a feeling of the game playing out like it was “on rails”. In an attempt to avoid this, he aimed to increase Sonic’s arsenal of available moves — somewhat moving away from the one-button simplicity of the original Mega Drive games — and provide branching paths throughout levels according to whether “Real-Time Interactions” (timed button presses according to on-screen prompts) were completed correctly. One of the biggest additions to Sonic Unleashed’s formula is a Quick Step move mapped to a controller’s shoulder buttons. 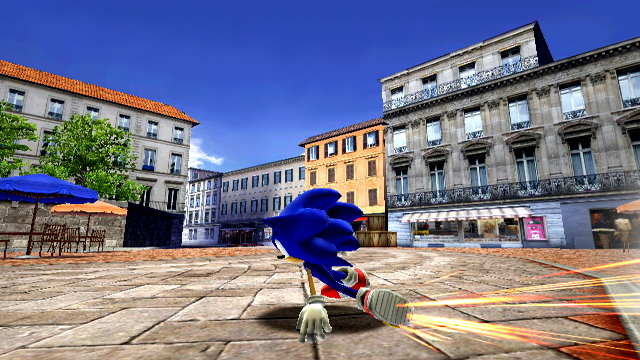 This allows Sonic to quickly “change lanes” by shifting sideways while continuing to move in the same direction. The addition of this move afforded Hashimoto and his team the opportunity to include high-speed sections with obstacles and still allow the player the opportunity to respond quickly. 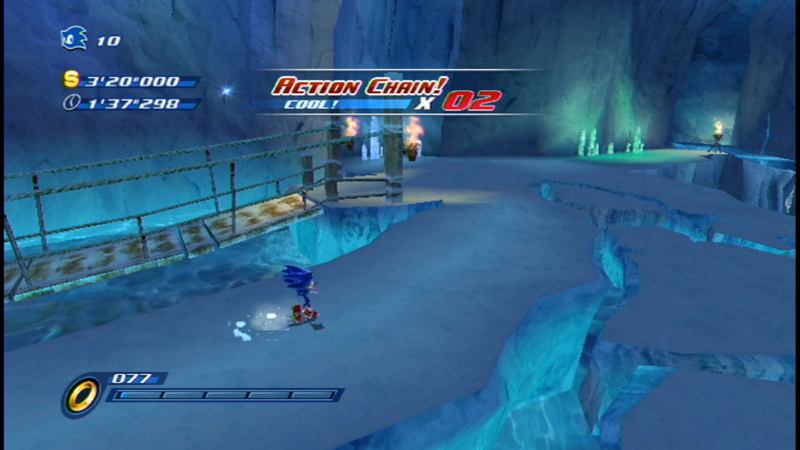 In some ways, it was an evolution of Sonic 2006’s Super Speed stages; indeed, the Sonic stages throughout all of Unleashed play out almost more like a racing game than a conventional platform game. Another thing that Hashimoto wanted to experiment with was the implementation of the Rings system Sonic games had incorporated since their earliest installments. Hashimoto suggested that the player having more than two rings never made any difference to the gameplay in many of the previous Sonic games, so he set out to do something a little different. The exact implementation varies between the two incarnations of Sonic Unleashed, but in the Wii version, the more rings you collect, the more boost gauges you can store up, allowing you more opportunity to fly through the level at even greater speeds. 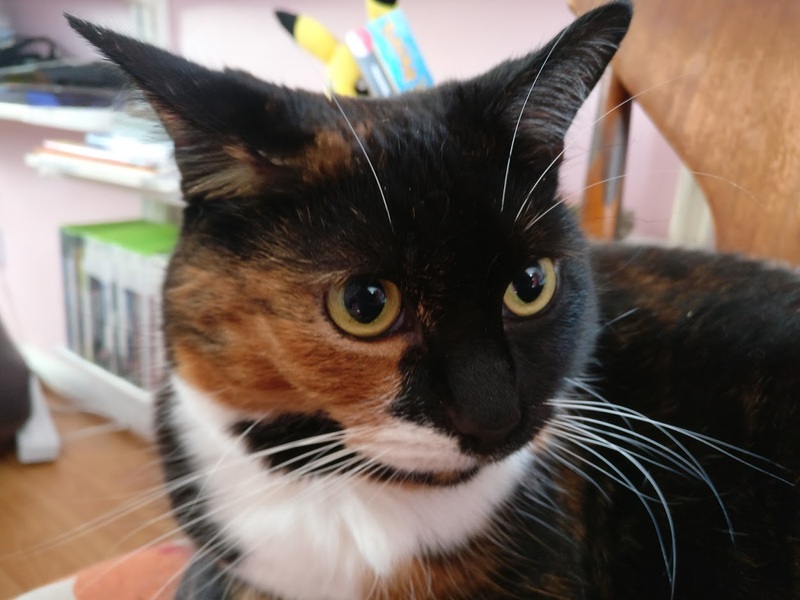 What would end up being Sonic Unleashed’s most controversial addition came about as a result of Hashimoto and artist Sachiko Kawamura wanting to develop what they described as “a stimulating element”. Their concept was to “transform Sonic into something wild”, and that in contrast to Sonic using his legs to run fast, his transformation should make use of his arms and hands for power rather than speed. Thus, the idea of the Werehog was born. At this point, it’s worth taking a moment to contemplate Sonic Unleashed’s overall narrative concept and how the Werehog fits in with all that, because it’s necessary to truly getting a feel for the game as a whole. Sonic Unleashed’s narrative is loosely based on the idea of the Gaia hypothesis: the suggestion that a planet is a complex system that is synergistic and self-regulating, with both its organic and inorganic material working in tandem to sustain life. 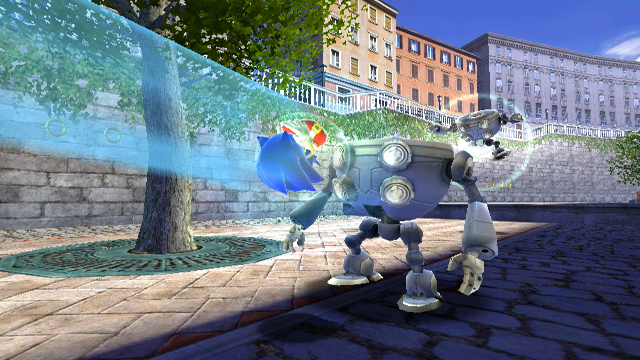 In the case of Sonic Unleashed, the idea is taken a bit further, made more abstract and ties in with the series’ overall subject matter of nature versus technology: the world on which the game is set has two “living” components named Dark Gaia and Light Gaia, and these are locked in a perpetual cycle of destruction and rebirth, forever ultimately balanced. After a dormancy cycle of millions of years, Dark Gaia destroys the world by shattering it apart, then Light Gaia puts it all back together again while sealing Dark Gaia away in the process. Unfortunately, as we join the action in Sonic Unleashed, Eggman has woken Dark Gaia up somewhat prematurely, causing its energy to scatter around the globe. Some of this energy was absorbed by people, causing them to behave strangely after nightfall, and a significant lump of it ended up in Sonic, causing him to transform into the Werehog when the sun goes down. And Light Gaia is nowhere to be seen, leaving Sonic to figure out exactly what is going on while dealing with his new condition. It’s important to take the very concept and setup of the Werehog into account when contemplating Sonic Unleashed, because it’s not only important to the narrative, it’s important to the game’s overall structure, too. In narrative terms, the introduction to Sonic Unleashed is one of the few times we see Sonic get absolutely defeated by Eggman. Super Sonic is invincible, we’ve been taught by the previous games, but Eggman manages to not only outwit him, the results of their conflict leave Sonic with an uncontrollable condition he doesn’t understand. This impacts the narrative in a pretty significant way: the Sonic in Sonic Unleashed is rather more humble than we’ve seen him in most of the previous games. Sure, he still likes to talk big — particularly when you complete a stage with a good rank — but his nightly transformations acting as a constant reminder of his failure and defeat have most certainly taken some of the “edge” off. In the English version, Jason Griffith puts in a good performance as Sonic in both his forms, with his delivery of the Werehog lines in particular showing us an angry, frustrated side of Sonic we haven’t really seen before. In gameplay terms, meanwhile, the Sonic/Werehog divide is used to take the core elements of Sonic games and split them into their own discrete components. In most previous Sonic games, these two aspects — speedy, skilful efficiency and considered, precise platforming — are combined together with level pacing ebbing and flowing as you progress, but here there’s a hard line drawn to split the two apart. Sonic stages are all about getting through as quickly as possible, nothing more; the slower-paced Werehog stages, meanwhile, are all about exploring, investigating and demonstrating different types of skill. The overall structure of the game is probably the most “adventure-like” of all Sonic’s games prior to this point — even the original Sonic Adventure. As the story progresses, Sonic will travel to several areas around the world in an attempt to find hidden temples in which he can charge up the Chaos Emeralds. As he does so, he’ll meet and interact with a variety of people in each of these locales, and in the process he will unlock various doors in that region’s shrine. A “sun” door in a shrine leads to Sonic’s “day” stages, a “moon” door leads to the Werehog’s “night” stages, and a “star” door leads to the altar on which Sonic can charge the Chaos Emerald — often after a boss fight. Sonic’s stages combine 2D and 3D elements together. While playing in 3D, there’s a strong emphasis on moving forwards similar to the Sonic Storybook games, and Sonic is able to “drift” around tight corners. Unlike the Storybook games, however, it is actually possible to turn around and go back to collect something you missed; rather than just running “out” of the screen, the camera actually turns around and faces the other direction when you do this. The 2D sections, on the other hand, tend to emphasise timing, positioning and spectacle. Because of the emphasis on speed in Sonic’s stages, there’s little in the way of truly precise platforming required, though it is often necessary to react quickly to new situations by, for example, using well-timed homing attacks on enemies to reach out-of-the-way paths. And that brings us to an important point: the speedy element doesn’t mean Sonic’s stages are completely linear. Generally, the routes branch numerous times throughout each stage, with one usually being obviously quicker than the others — though often a bit more challenging to reach. When playing as Sonic you generally have to play several variations on the same stage. The first is always a simple “get to the goal” challenge over the entirety of the stage with no special conditions, but after that there is usually a mission where you have to collect a certain number of rings against a time limit in a small section of the stage, and perhaps also missions where you have to reach the goal against a tight time limit, without attacking enemies or without breaking any scenery objects. These latter types of challenge in particular are strongly reminiscent of the approach Sonic and the Secret Rings and Sonic and the Black Knight took to its overall structure, providing interesting twists on the same content. 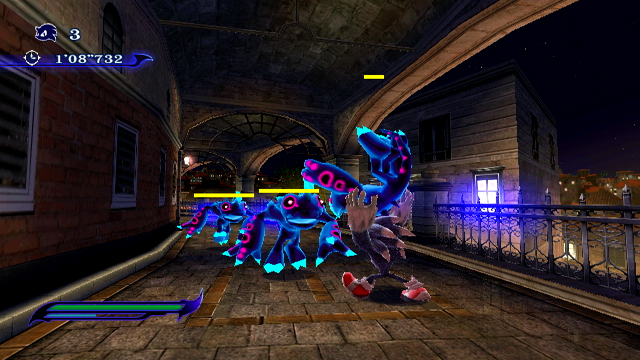 The Werehog component of the game is actually rather more substantial, with each Werehog stage unfolding over the course of at least three unique Acts rather than the “same stage, different challenges” approach of Sonic’s levels. The Werehog’s only goal in each of these is to reach the Goal Ring at the end of the level, but this isn’t simply a case of running forwards and responding to obstacles — there’s a lot more “substance” to the overall gameplay. The maps themselves are much more varied, for one thing, feeling rather more like at least semi-realistic environments than racecourses. There are often multiple routes to go, hidden areas to find, combat encounters to defeat and even some light puzzle-solving elements along the way. Werehog stages have a hard line between exploration and combat gameplay. When entering an area that has enemies, the exits temporarily block off and do not open up again until Sonic defeats all his foes. This is accomplished through an interesting combo system where two buttons are used to correspond to Sonic’s left and right arms, with the most effective attacks involving alternating between them and perhaps weaving in a “double-handed” attack now and then to trigger various special abilities. Sonic is also able to pick up items and throw them at enemies — especially useful for flying foes, or flaming enemies that need to be doused with water before they can be hit. Outside of combat, the game gradually introduces you to a variety of environmental objects, initially in isolation but, as you progress, starting to incorporate them in combination. 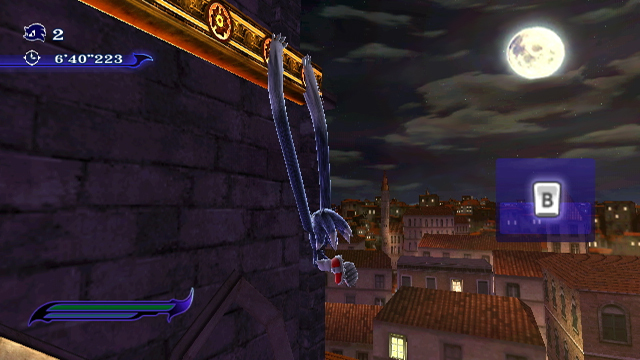 Many of these involve making use of the Werehog’s extendable arms to grab things as well as the fact he can double-jump, allowing him to reach much greater heights than regular ol’ Sonic. For example, negotiating a level might involve double-jumping up to a ledge, hanging on to it and shimmying across, climbing up when there’s enough space, leaping to a pole then dropping off the bottom of said pole when a platform passes underneath. This is obviously an extreme example; the game starts off much more simply, but by the end there are some significant platforming challenges to overcome in the Werehog stages. Exploration and experimentation is encouraged through the Werehog’s level grading system. 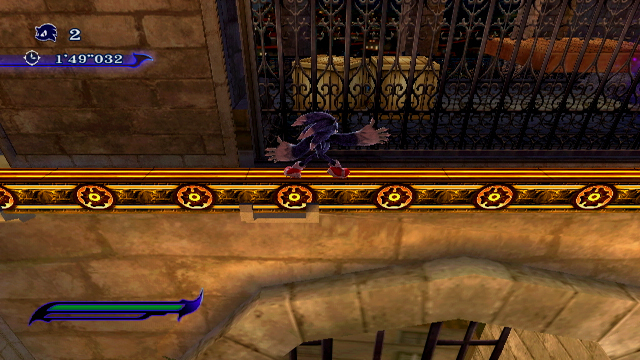 While Sonic in his regular form is graded solely on the time he takes to complete a level, attaining a high grade as the Werehog requires that you complete the level within a par time, with sufficient Rings in your possession, and having acquired a particular amount of “Dark Gaia” energy both through defeating enemies and finding it in hidden canisters around the stage. This energy then acts as “experience points” at the end of a Werehog stage, gradually unlocking new abilities for Sonic in his Werehog form and, narratively speaking, representing him becoming more comfortable and familiar with his new nocturnal incarnation. The Werehog aspect of the game has drawn a certain amount of criticism and even derision over the years, primarily because people saw it as being antithetical to what they thought Sonic was all about. 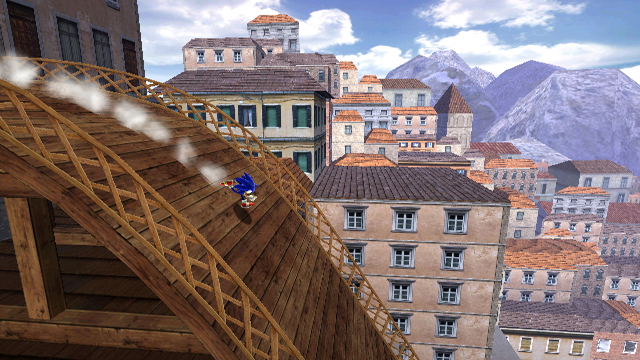 But these stages actually make up some of the most interesting parts of Sonic Unleashed by far. 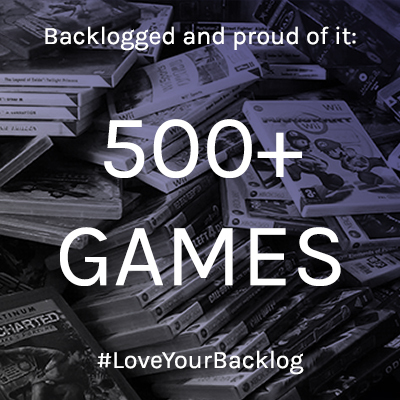 They provide varied challenges, feature diverse mechanics that evolve over the course of the game and are genuinely satisfying to complete. Sure, they are a bit of a change from what you might expect from a Sonic game — but that doesn’t necessarily mean they’re a bad thing, and it’s not as if the Sonic stages aren’t there either! At this point it’s worth highlighting some of the specific things that Sonic Unleashed does really well, with one of the most significant being its use of a strictly directorial approach to its camera. Unlike many other previous 3D Sonic games, in Sonic Unleashed you have no control over the camera whatsoever. The camera is, instead, “scripted” as you progress through the levels, usually to frame the action in a way that makes it clear and easy to see what’s going on but occasionally just to mess with your expectations a little bit. One particularly good example of how the camera is used effectively comes in the various boss fights. Shifts in camera angle are often used as cues for phase changes in the battle — and as signals that you should be ready for a particular attack, or to unleash your own attacks. In the case of Werehog boss fights, the camera angles itself so you can see either your target (if it’s time to attack) or incoming attacks (if it’s time to defend), while in Sonic boss fights, varied camera angles are used to provide a fun range of mechanics to engage with. Two of these battles even incorporate some light “bullet hell” elements as the action shifts to a top-down view for one phase, tasking Sonic with dodging a series of dangerous laser and bullet attacks before finding an opening to get a hit in. 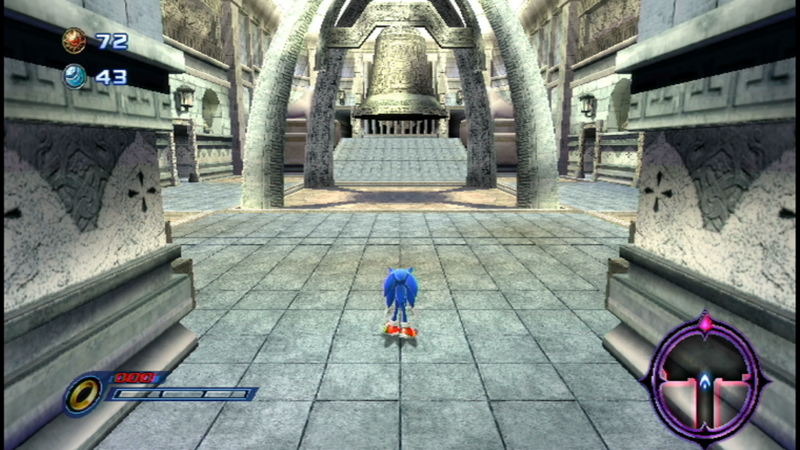 The temples that hold the doors necessary for progression are also home to one of the most interesting things about the Wii and PS2 version that isn’t present in the HD incarnation of Sonic Unleashed: by completing levels, you earn medals, and these medals can be used in the various temples to unlock other side doors. Behind each of these side doors is a short environmental puzzle to solve, with the rewards usually taking the form of unlockable bonus material such as music tracks and concept art, or permanent increases to the stock of lives Sonic starts each stage with. These small areas also make excellent use of camera angles to give you subtle hints about how to progress. Each region also has a strong sense of identity. The very concept of the game involves Sonic travelling around the world — hence its Japanese title, Sonic World Adventure — and so each region has been made to feel distinct through use of architecture, colour schemes, the appearance of its residents and even its music. 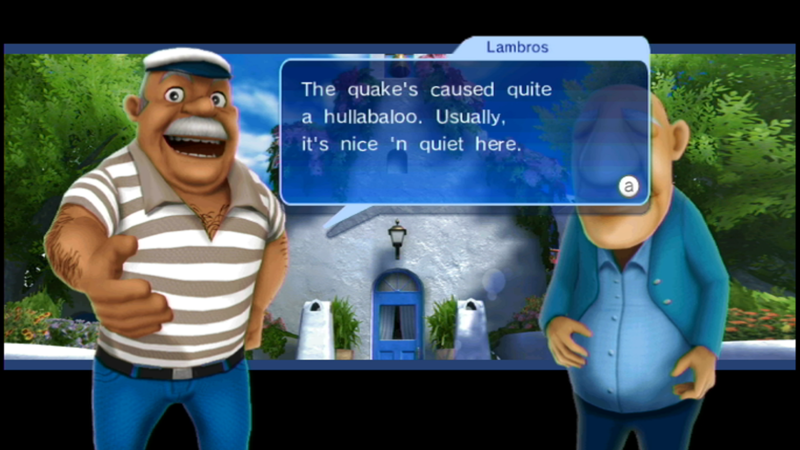 While the planet on which the game unfolds is fictional, the real-world influences are readily apparent; the town of Spagonia marks the series’ second use of continental Europe as an inspiration, for example, while the use of authentic-sounding gamelan music in the Adabat region makes it obvious this area was based on real-world Indonesia. The music is a particular highlight of the experience, actually; not only do the compositions reflect the overall “character” of the different regions Sonic explores, but the overall quality of them is excellent, too. The main theme of the game is performed by the Tokyo Philharmonic Orchestra, and sounds like something right out of an adventure movie (or, indeed, a modern Mario game) while the stage themes incorporate sounds of the various regions and combine them with various other influences according to whether you’re playing as Sonic or the Werehog at that time. Sonic’s stages have a strong rock/drum and bass fusion feel to their soundtracks, for example, while the Werehog levels make heavy use of jazz influences. Hell, the main “battle” theme is a flat-out big band number, with some delightfully blaring brass sounds giving an oddly 1960s feel to the combat scenes. Sonic Unleashed is a great addition to Sonic’s lineup of modern 3D games — and a rather underrated experience. Cast off your prejudices about what you think a Sonic game “should” be and accept this game for what it is and you’ll have a great time; then look a little deeper and you’ll realise that all your favourite things about Sonic games are still well and truly here, just a bit… different to how you’ve come across them before. Plus it’s simply a cracking good adventure story with a spectacular finale. You couldn’t ask for anything more from a true successor to Sonic Adventure, really.